How can I create publication-quality graphics in R? 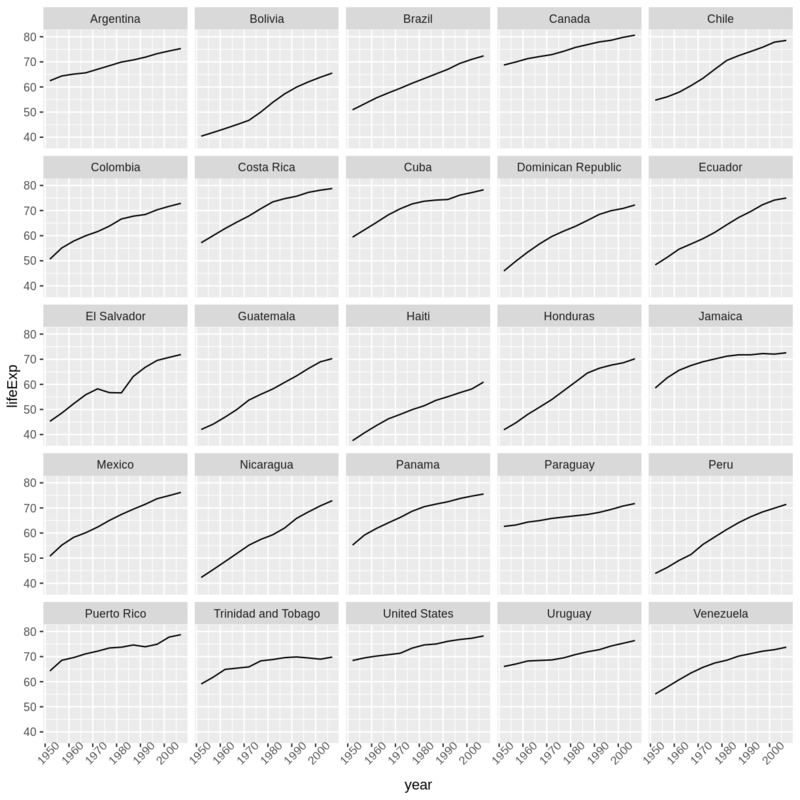 To be able to use ggplot2 to generate publication quality graphics. 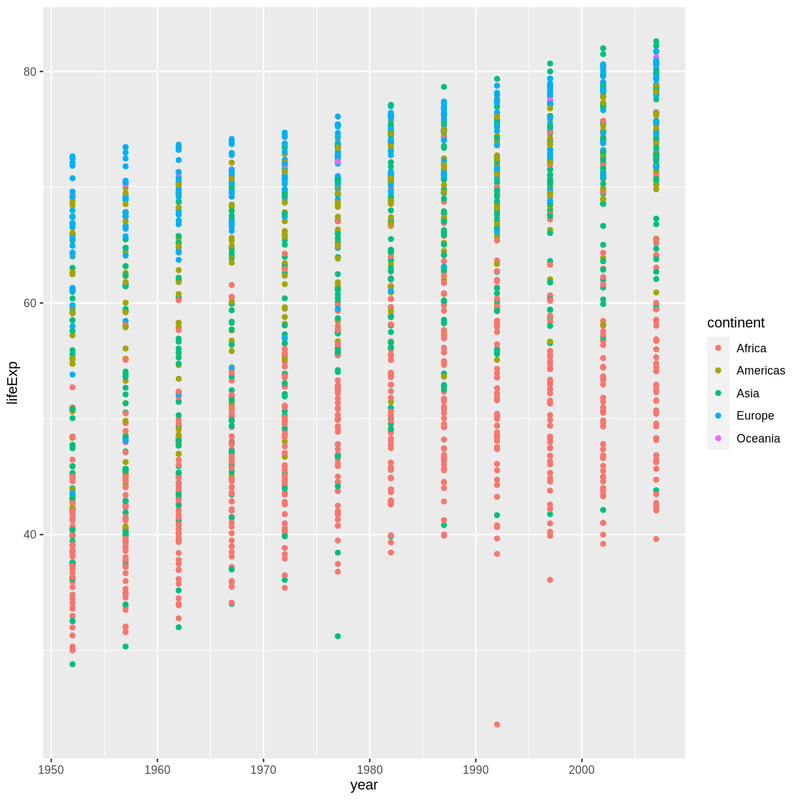 To apply geometry, aesthetic, and statisics layers to a ggplot plot. To manipulate the aesthetics of a plot usng different colors, shapes, and lines. To improve data visualization through transforming scales and paneling by group. To save a plot created with ggplot to disk. Plotting our data is one of the best ways to quickly explore it and the various relationships between variables. 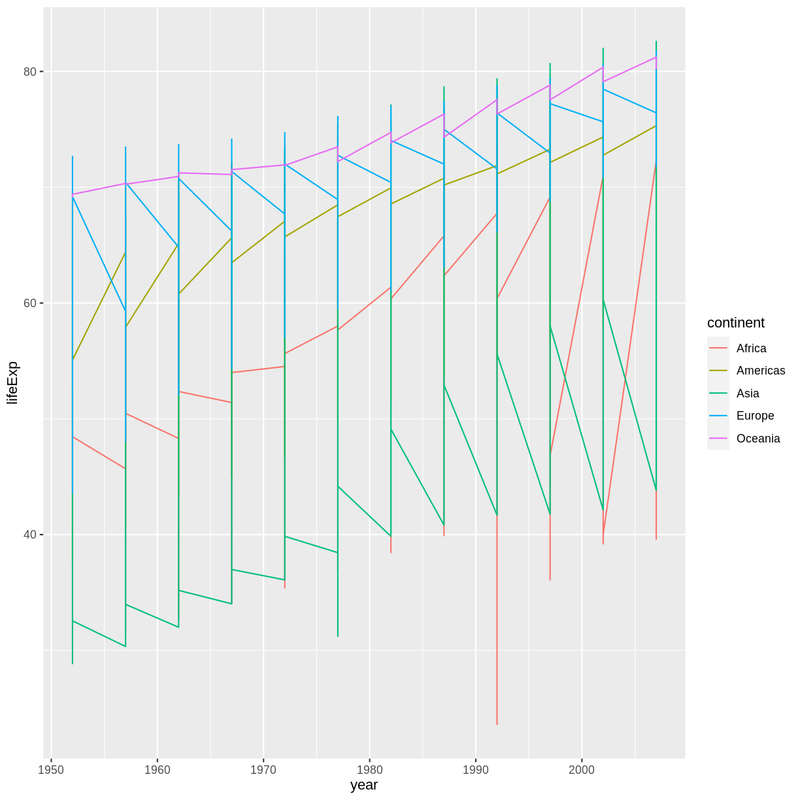 There are three main plotting systems in R, the base plotting system, the lattice package, and the ggplot2 package. Today we’ll be learning about the ggplot2 package, because it is the most effective for creating publication quality graphics. 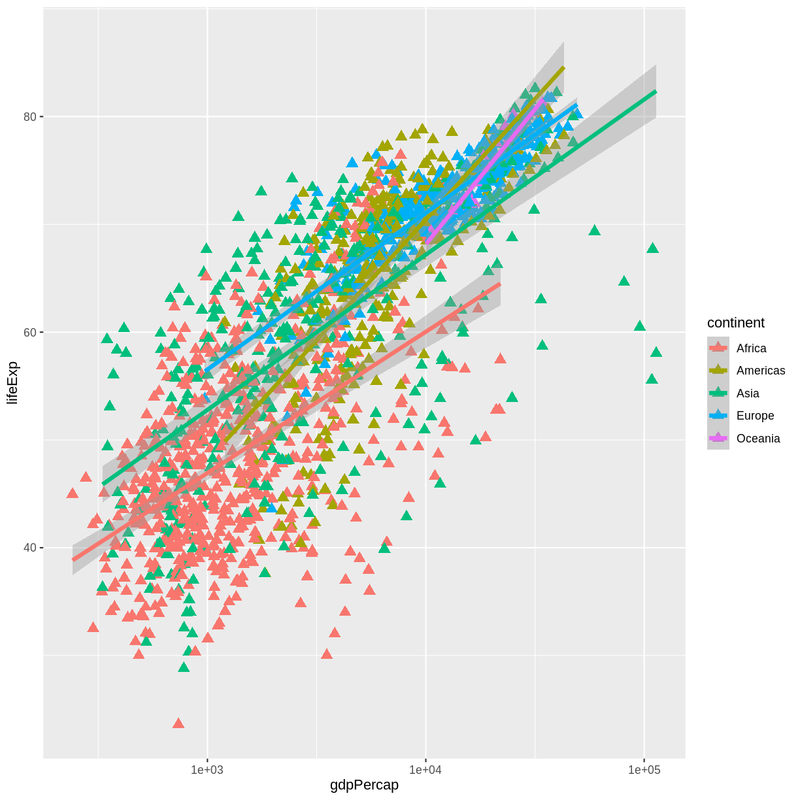 ggplot2 is built on the grammar of graphics, the idea that any plot can be expressed from the same set of components: a data set, a coordinate system, and a set of geoms–the visual representation of data points. The key to understanding ggplot2 is thinking about a figure in layers. This idea may be familiar to you if you have used image editing programs like Photoshop, Illustrator, or Inkscape. So the first thing we do is call the ggplot function. This function lets R know that we’re creating a new plot, and any of the arguments we give the ggplot function are the global options for the plot: they apply to all layers on the plot. 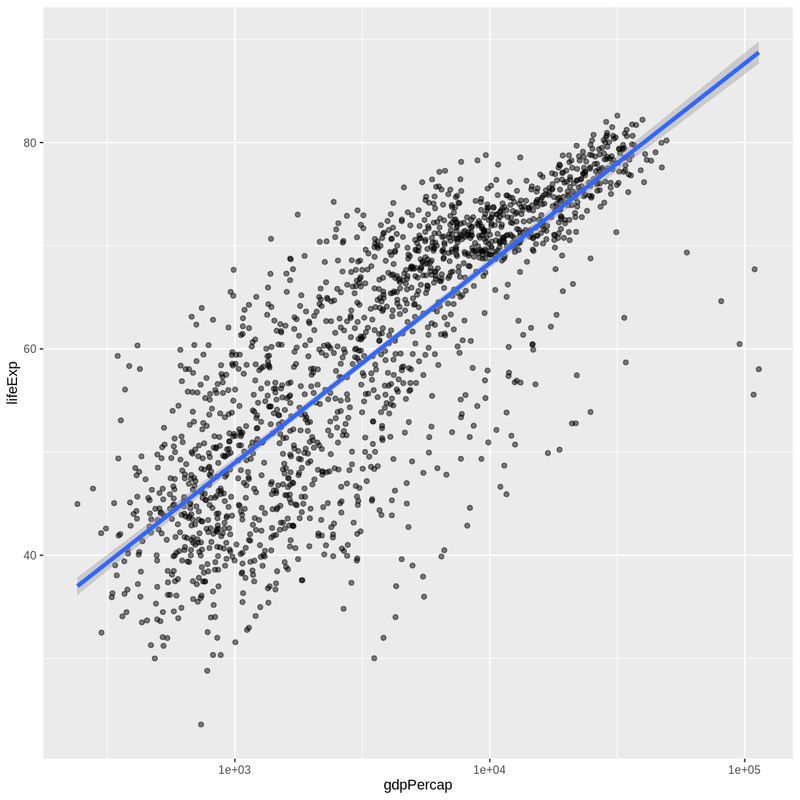 We’ve passed in two arguments to ggplot. 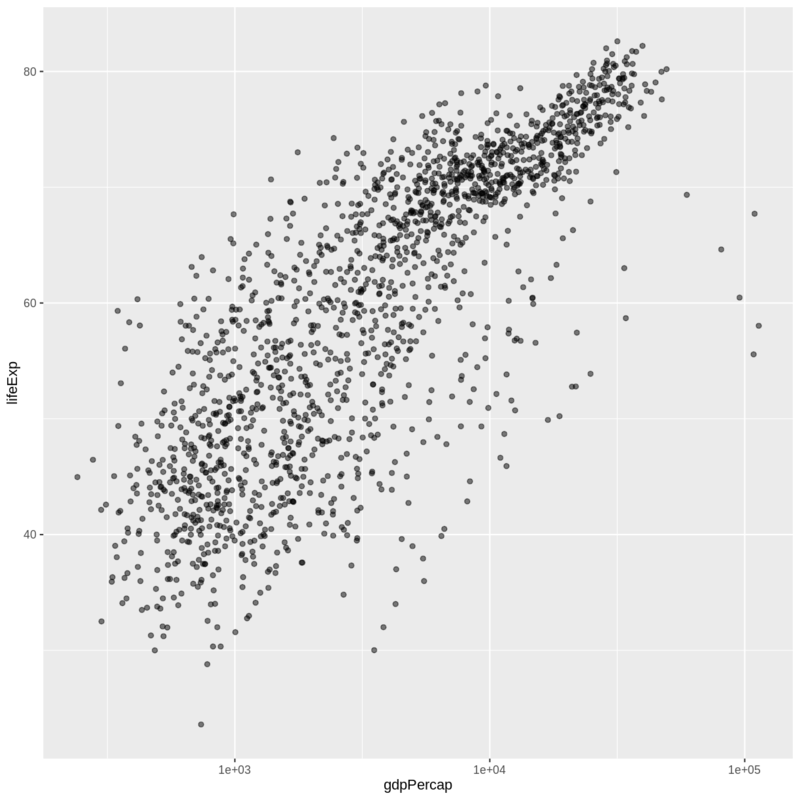 First, we tell ggplot what data we want to show on our figure, in this example the gapminder data we read in earlier. For the second argument, we passed in the aes function, which tells ggplot how variables in the data map to aesthetic properties of the figure, in this case the x and y locations. 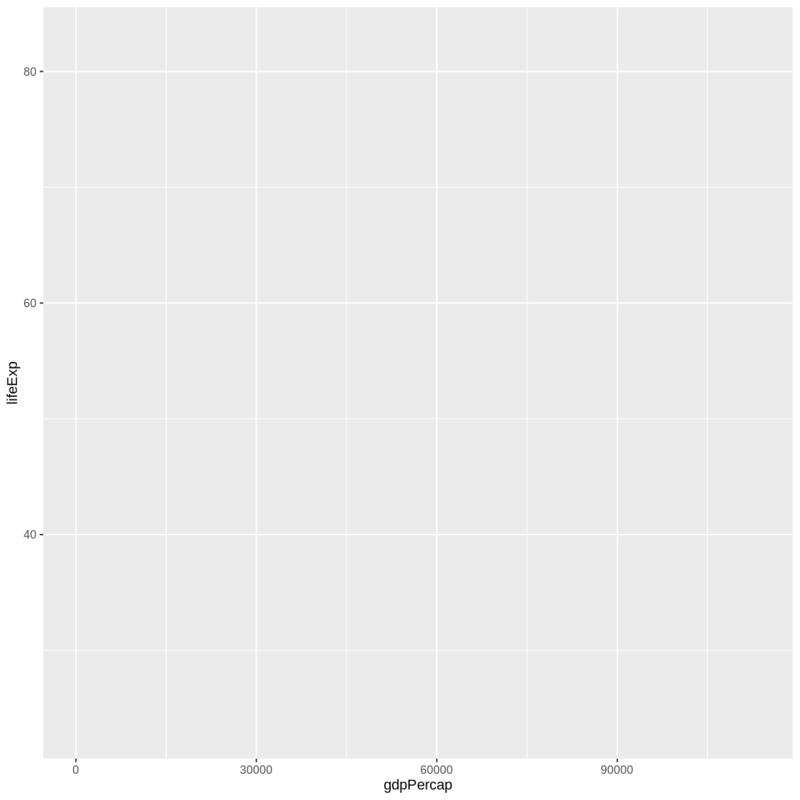 Here we told ggplot we want to plot the “gdpPercap” column of the gapminder data frame on the x-axis, and the “lifeExp” column on the y-axis. Notice that we didn’t need to explicitly pass aes these columns (e.g. 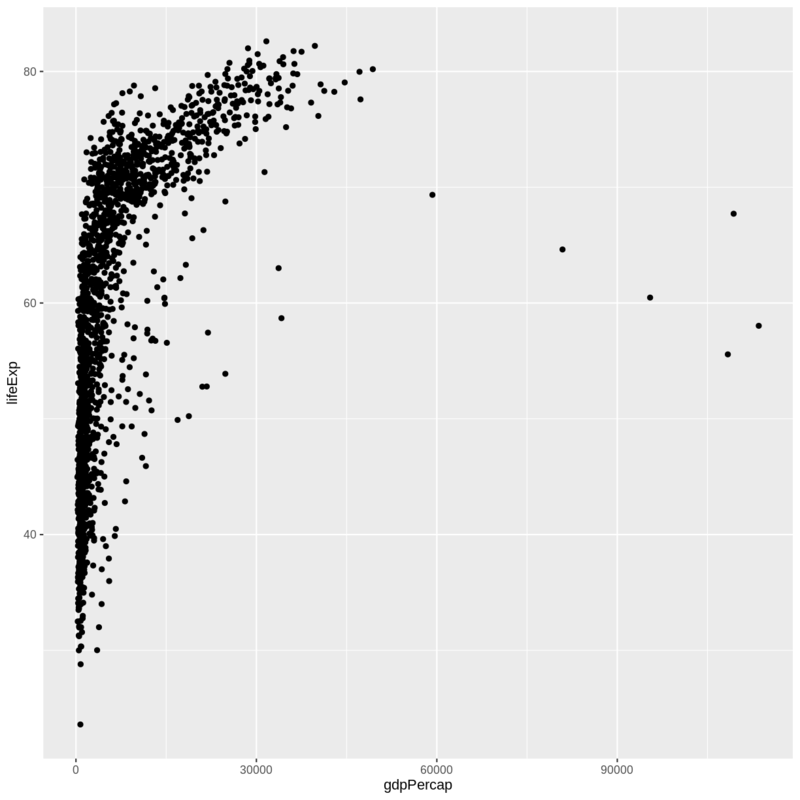 x = gapminder[, "gdpPercap"]), this is because ggplot is smart enough to know to look in the data for that column! 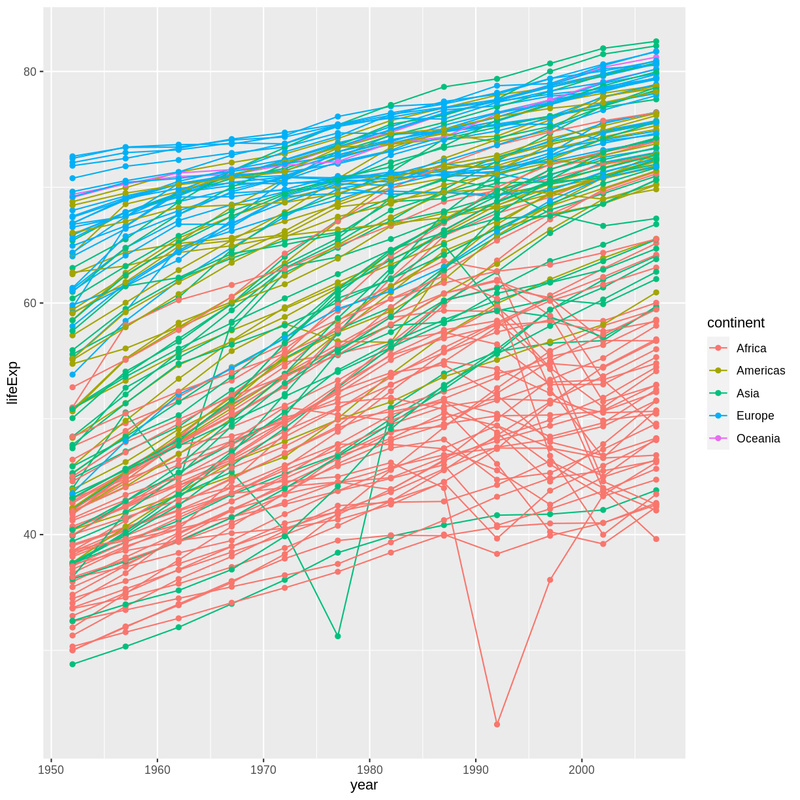 Hint: the gapminder dataset has a column called “year”, which should appear on the x-axis. In the previous examples and challenge we’ve used the aes function to tell the scatterplot geom about the x and y locations of each point. Another aesthetic property we can modify is the point color. Modify the code from the previous challenge to color the points by the “continent” column. What trends do you see in the data? Are they what you expected? Instead of adding a geom_point layer, we’ve added a geom_line layer. 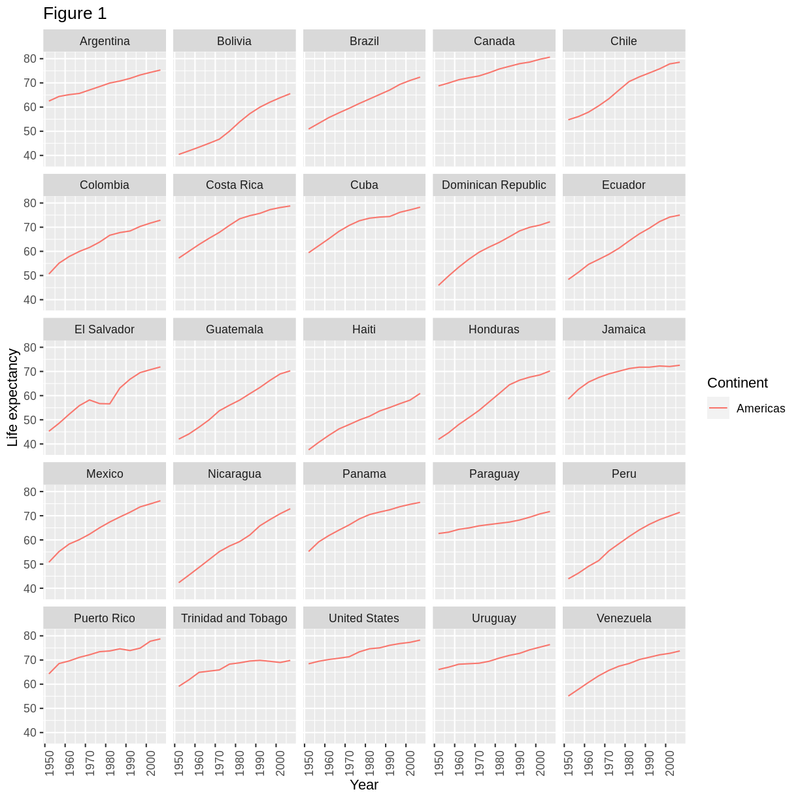 We’ve added the by aesthetic, which tells ggplot to draw a line for each country. In this example, the aesthetic mapping of color has been moved from the global plot options in ggplot to the geom_line layer so it no longer applies to the points. Now we can clearly see that the points are drawn on top of the lines. So far, we’ve seen how to use an aesthetic (such as color) as a mapping to a variable in the data. For example, when we use geom_line(mapping = aes(color=continent)), ggplot will give a different color to each continent. But what if we want to change the colour of all lines to blue? You may think that geom_line(mapping = aes(color="blue")) should work, but it doesn’t. Since we don’t want to create a mapping to a specific variable, we simply move the color specification outside of the aes() function, like this: geom_line(color="blue"). Switch the order of the point and line layers from the previous example. What happened? The lines now get drawn over the points! Currently it’s hard to see the relationship between the points due to some strong outliers in GDP per capita. We can change the scale of units on the x axis using the scale functions. These control the mapping between the data values and visual values of an aesthetic. We can also modify the transparency of the points, using the alpha function, which is especially helpful when you have a large amount of data which is very clustered. The log10 function applied a transformation to the values of the gdpPercap column before rendering them on the plot, so that each multiple of 10 now only corresponds to an increase in 1 on the transformed scale, e.g. a GDP per capita of 1,000 is now 3 on the y axis, a value of 10,000 corresponds to 4 on the y axis and so on. This makes it easier to visualize the spread of data on the x-axis. Notice that we used geom_point(alpha = 0.5). As the previous tip mentioned, using a setting outside of the aes() function will cause this value to be used for all points, which is what we want in this case. But just like any other aesthetic setting, alpha can also be mapped to a variable in the data. For example, we can give a different transparency to each continent with geom_point(mapping = aes(alpha = continent)). There are two ways an aesthetic can be specified. Here we set the size aesthetic by passing it as an argument to geom_smooth. Previously in the lesson we’ve used the aes function to define a mapping between data variables and their visual representation. Modify the color and size of the points on the point layer in the previous example. Hint: do not use the aes function. Modify your solution to Challenge 4a so that the points are now a different shape and are colored by continent with new trendlines. Hint: The color argument can be used inside the aesthetic. Modify Challenge 4 so that the points are now a different shape and are colored by continent with new trendlines. Hint: The color argument can be used inside the aesthetic. Earlier we visualized the change in life expectancy over time across all countries in one plot. Alternatively, we can split this out over multiple panels by adding a layer of facet panels. Focusing only on those countries with names that start with the letter “A” or “Z”. The facet_wrap layer took a “formula” as its argument, denoted by the tilde (~). This tells R to draw a panel for each unique value in the country column of the gapminder dataset. To clean this figure up for a publication we need to change some of the text elements. The x-axis is too cluttered, and the y axis should read “Life expectancy”, rather than the column name in the data frame. We can do this by adding a couple of different layers. The theme layer controls the axis text, and overall text size. Labels for the axes, plot title and any legend can be set using the labs function. Legend titles are set using the same names we used in the aes specification. Thus below the color legend title is set using color = "Continent", while the title of a fill legend would be set using fill = "MyTitle". There are two nice things about ggsave. First, it defaults to the last plot, so if you omit the plot argument it will automatically save the last plot you created with ggplot. Secondly, it tries to determine the format you want to save your plot in from the file extension you provide for the filename (for example .png or .pdf). If you need to, you can specify the format explicitly in the device argument. This is a taste of what you can do with ggplot2. RStudio provides a really useful cheat sheet of the different layers available, and more extensive documentation is available on the ggplot2 website. Finally, if you have no idea how to change something, a quick Google search will usually send you to a relevant question and answer on Stack Overflow with reusable code to modify! Create a density plot of GDP per capita, filled by continent. Transform the x axis to better visualise the data spread. 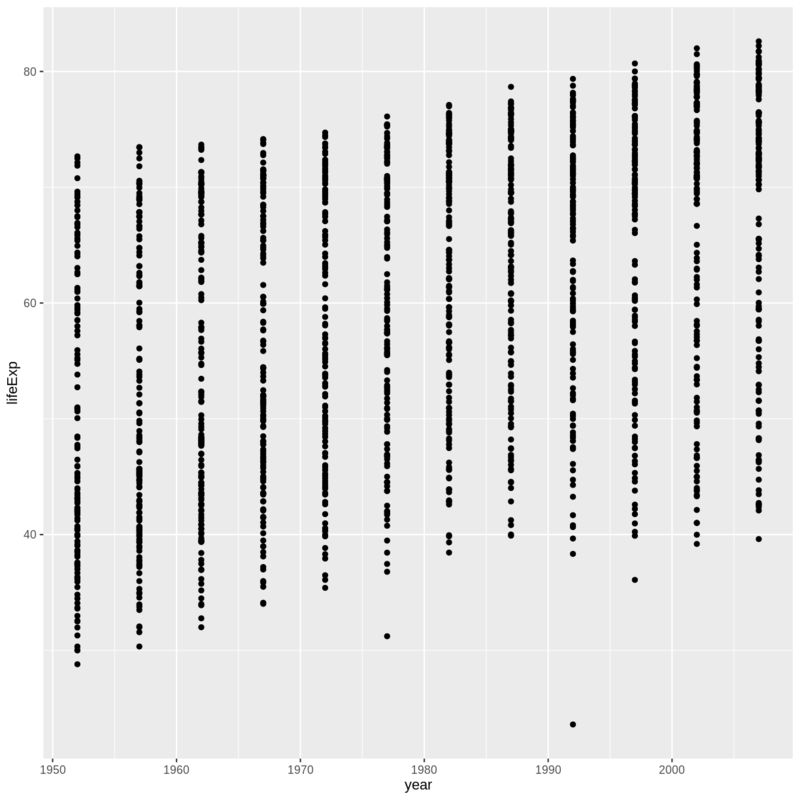 Add a facet layer to panel the density plots by year. 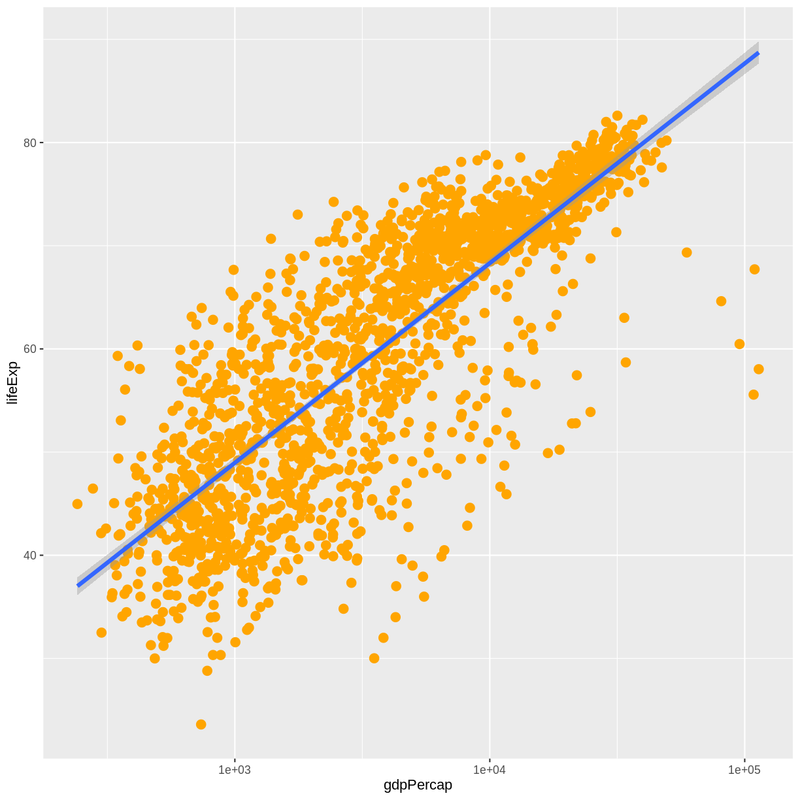 Use ggplot2 to create plots. Think about graphics in layers: aesthetics, geometry, statistics, scale transformation, and grouping.